Tom Kjos and others are planning to re-launch the concept of an ALMS Yearbook. 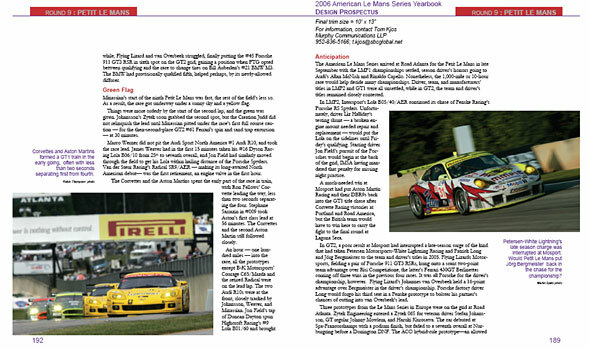 “There has not been an American Le Mans Series yearbook published since 2000 and with the expectation of an exceptional 2007, we believe that it is important to produce a yearbook for the 2006 season that will be available to series participants and suppliers, and will be an important element of at-track experiences next season,” writes Tom Kjos. The group involved is seeking commitments from teams and others to purchase the finished product. It is planning a print-run of 2,500 copies, to be sold at $59.95. Tom Kjos - principal writer. Janos Wimpffen - contributing supplementary written material and data tables. Robert Brannon - contributing writer. John Wilcox - 20 years of experience as a publisher and editor.